Clear Story creates lighting designs that acknowledge the primacy of the architecture and work with structural elements to create unique, signature spaces. Our goal is to design lighting approaches that allow the form of the architecture to speak for itself, creating a sense of place while responding to surrounding context. Clear Story provides a full range of architectural lighting design services, delivered with an emphasis on sustainable technologies. Clear Story developed the Site Lighting Master Plan for the Bakery Square 2.0 development in Pittsburgh’s East Liberty neighborhood, and continues to oversee lighting design and specifications for each new building under construction. Energy efficient LED technology and a consistent fixture vocabulary contribute to the architectural character of Bakery Square 2.0 and Bakery Living, the first completed residential building. The project, developed by Walnut Capital and designed by Strada, has been recognized by the Urban Land Institute with a Catalytic Place Award. Link to Strada Architects website that explains the master plan of the project. 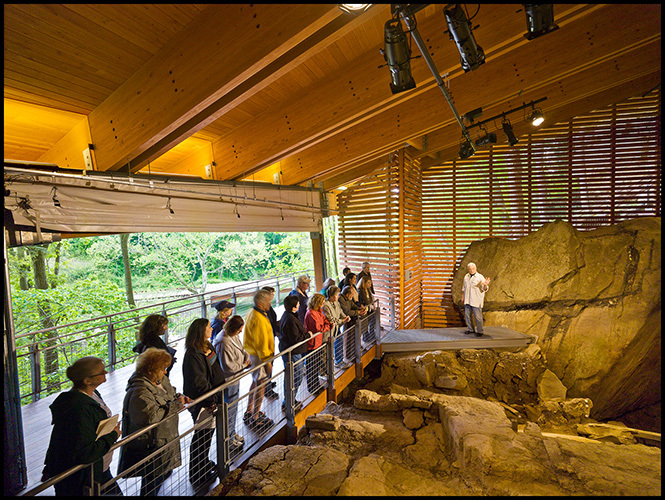 Clear Story designed and installed a lighting system for the newly-constructed Meadowcroft Rockeshelter enclosure, designed by Pfaffman & Associates. A National Historic Landmark in Avella, Pennsylvania, Meadowcroft features a massive, 16,000 year-old rock overhang used by North America’s earliest human inhabitants. Clear Story worked with the project archaeologist to develop of narrative script, used when describing the historical and geological features of the site to visitors on the observation platform. The non-linear nature of this script demanded a truly interactive, user-controlled lighting system. The design intent was to integrate docent narration with lighting system control so that each feature was illuminated on cue as it was presented, directing the viewers’ attention throughout the experience. The project’s technical and logistical challenges required creative design solutions from Clear Story. For example, the lighting system was to be installed on a sloped ceiling of the enclosure building high above the renowned archaeological dig site. Equipment selection and installation, as well as access requirements, could not interfere with or disturb the working dig site. Clear Story reviewed and consulted on exterior and interior lighting systems of Three PNC Plaza, a mixed-use high rise in Pittsburgh, Pennsylvania with 752,000 square feet over 23 floors. Clear Story was charged with reducing the overall cost of the lighting package while bringing the approach closer to the original conceptual vision for the space. To achieve a lighting solution consistent with the design aesthetic and compatible with the structure of Three PNC, Clear Story worked closely with architects at Gensler to evaluate the engineered lighting package, improve the efficiency of the system, and integrate lighting and architecture to achieve PNC’s design goals. Clear Story’s creative approach of integrating energy-efficient products and new lighting technologies into the revised design reduced lighting system costs by 10% and enhanced the aesthetic outcome of the project. After the initial lighting review, Clear Story continued their work on other elements of Three PNC Plaza including fabrication and installation of custom lighting fixtures by regional glass artisans. Using components sourced within a 100-mile radius of the project site, and energy efficient LED and fluorescent light sources, these custom light fixtures are products of the local creative economy and help to reinforce the sustainable design values of PNC.